Disney World resort rooms have several views that you can choose when booking, and then there are lots of requests you can make to get a room that will be a good fit. Today, I've got information on each resort and how to get a room that's right for you. Which requests should you make? One of the first decisions you'll encounter when booking your Disney World trip is which view to book at your resort. Some resorts have only 1 or 2 views to choose from; other resorts have more than 10. A view is essentially a guaranteed type of room. Once you book it, you know that's what you'll have on your trip. If there are things you absolutely must have and there's a view for that, make sure you book it. Examples: king bed, bunk beds, etc. After your room is booked, you can make room requests so that you can narrow down the location of the room you'll have for your trip. Just make sure your requests don't conflict and aren't redundant with the room view you booked. If you book a Preferred Room at Caribbean Beach Resort and then request to be in Barbados Village, that doesn't make sense because there are no Preferred Rooms in that section. If you book a water view room, there's no need to also request a water view room since you know that's what you're getting. There are 2 types of room requests: 1.) 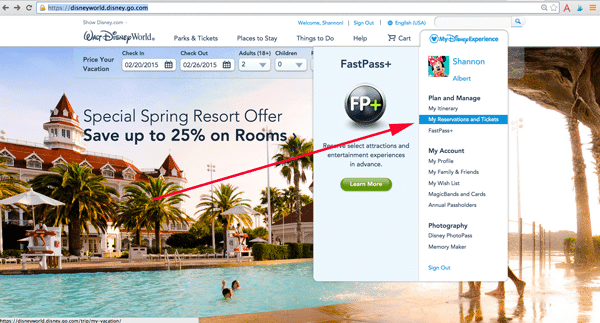 the ones you can make up to 60 days beforehand using Disney's online check-in system and 2.) requests that you call in to have added to your reservation (people used to fax requests but I don't recommend that as the effectiveness varies between resorts). Don't request a specific room number, but put in requests that emphasize what's important to you. Keep your requests to a minimum - usually 2-3 at the most. Online check-in is something you can do up to 60 days before your trip (I suggest doing it at least 10 days beforehand) and makes sense for anybody who wants to save some time at the resort since most/all of the info they'd ask you at the front desk can be entered online. You access this by logging into your My Disney Experience account, going to the My Disney Experience menu and selecting "My Reservations and Tickets." You should then be taken to the screen that shows your resort reservation and has a link you can click to check-in online. You will be shown a screen like this that you can use to make up to 2 requests. Who shouldn't use online check-in? People who want to ask for an upgrade and/or discuss room options at the front desk. Another perk to online check-in: Disney is starting to implement a system where people who check-in online can bypass the front desk and go straight to their room (this will be fully rolled out by mid-March 2015, except for Ft. Wilderness). To use this system, people must have their MagicBands shipped to their house ahead of time, check-in online, and provide a way of being contacted (text or email). If you use online check-in but don't get to bypass the front desk during your trip, be sure to at least get into the online check-in line at your resort which should be shorter and quicker than the regular line. If you want to make requests that aren't available in the online check-in process, you can provide more specific requests by calling them in (note: if you're using a travel agent, they will need to call them in). The way that it works is that the reservations are sent to the resorts about 5 days beforehand when a room assigner goes through all of them and starts to assign rooms. They will first assign groups who are linked. If you're traveling as a group who has at least 2 rooms, be sure to get a "travel with" number so you will at least be placed together. Then the room assigners will move on to the reservations that have requests. They'll have the online requests you made + they will consider requests that were called in. The number to call to add your room requests is 407-939-7630. If you have special requests due to a disability, you can call 407-939-7807. Below, I've listed out the online check-in requests for each resort, which requests are valid for each type of room view, and other requests you might consider making by phone. There are 2 room views you can book at All-Star Movies - Standard and Preferred - and lots of online room request options. Since so many rooms are considered Preferred Rooms here, requests become even more important to get the location that you want. Corner Room 2nd Floor Lndscp View Love Bug Sect. Toy Story Sect. Near Trans. Ground Floor Highest Floor 101 Dalm. Sect. Mighty Ducks Sect. Near Elev. If you booked a Standard View room, the Mighty Ducks section is about as close to All-Star Music as it is the main building at All-Star Movies. If you end up in that section, you could just as easily use the buses and food court at either one. If you booked a Preferred Room and want to be as close to Cinema Hall as possible, I'd suggest combining requests to be near transportation with the section of your choice. You can book 3 kinds of rooms at All-Star Music - Standard, Preferred, or a Family Suite. Ground Floor Highest Floor Broadway Hotel Sect. Rock Inn Sect. Near Trans. 2nd Floor Landscape View Calypso Sect. Near Elev. People who want quieter rooms should request landscape view with a higher floor. Those who booked a Standard Room and want to be as close to Melody Hall as possible should consider requesting to be near transportation (available in the online check-in process) and in the Jazz Inn buildings (not available to request online so you'll need to call). 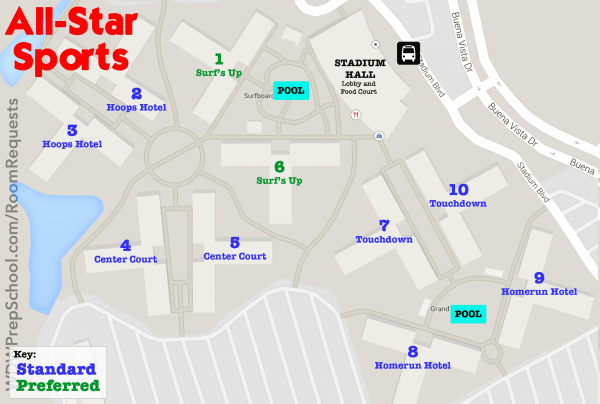 You can book two types of rooms at All-Star Sports - Standard and Preferred. Grnd Floor Highest Floor Lndscp View Near Elev. Cntr Ct Sect. Home Run Sect. T-down Sect. 2nd Floor Upper Floor Lower Floor Near Trans. Hoops Hotel Sect. Surf's Up Sect. 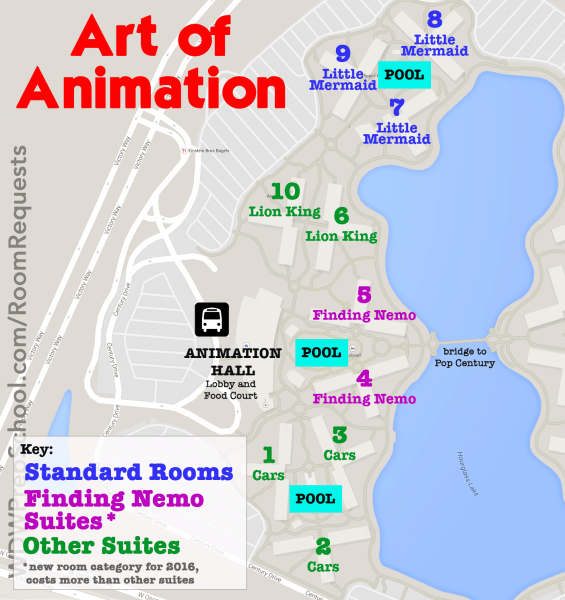 At Art of Animation, you can book a Standard Room or Family Suite. When booking a Family Suite, you'll get to specify which section at the time you book. Lake views or landscape views on a higher floor will be the quietest. Consider also asking for a corner room. Since there are no Preferred Rooms at Art of Animation, I'd highly suggest requesting to be near transportation to cut down on walking. Because the Preferred rooms are available in so many areas, I'd recommend booking the Preferred Pool View to guarantee you'll be as close to the main building as possible. Ground Floor 4th Floor Lake View Near Trans. 60's Sect. 80's Sect. 2nd Floor Highest Floor Lndscp View 50's Sect. 70's Sect. 90's Sect. Other requests you might consider making by phone: King bed (for 2 people, or 2 people plus a child under 3). To guarantee this, you can book a King Bed room. Putting it as a request won't guarantee it. Not available in Trinidad South. Buildings don't have elevators so request ground floor if you don't want to climb stairs. Other requests you might consider making by phone: King bed (for 2 people, or 2 people plus a child under 3). To guarantee this, you can book a King Bed room. Putting it as a request won't guarantee it. If you have a Standard Room but want to reduce walking as much as possible, you could request Cabanas 8A due its proximity to a bus stop, the main pool area, and a relatively short walk to the main building. Most resorts have the main pool and the main building together, but they are separate here. Decide which is more important to you and request a room accordingly. Other requests you might consider making by phone: 1.) King bed (for 2-3 people). To guarantee this, you can book a King Bed room. Putting it as a request won't guarantee it. 2.) Specific buildings. If you have your heart set on a particular building or area, you could add that to your reservation. Just be sure to request a building that matches the type of room you booked. Elevators only exist in buildings 80, 85, 90, 95 (the Magnolia Bend section) so if you don't want to do stairs, either request ground floor in the Alligator Bayou buildings (which is all buildings except for 80, 85, 90 and 95) or request to be in Magnolia Bend. Don't request second floor and highest floor together. Highest floor in buildings 80, 85, 90, and 95 is the 3rd floor. All other buildings are 2 stories. Corner rooms in the Alligator Bayou section often give you 2 windows instead of 1. Corner Room Second Floor Near Elevator Ground Floor Near Trans. Other requests you might consider making by phone: 1.) King bed (for 2 people, or 2 people plus a child under 3). To guarantee this, you can book a King Bed room. Putting it as a request won't guarantee it. 2.) Specific buildings. If you have your heart set on a particular building or area, you could add that to your reservation. Just be sure to request a building that matches the type of room you booked. The resort is small so none of the rooms are very far from everything, but request building 3 or 4 if you booked a Standard View room and want to be closest to the main building and bus stop. Corner rooms have two windows so request that if you're interested in having that option. The information below is for Animal Kingdom Lodge, not the Villas. I'll add the Villas info when I have a complete list of the online check-in options available there. Ground Floor Upper Floor Near Lobby Near Elevator Highest Floor Kudu Trail View Lower Floor Near Trans. Other requests you might consider making by phone: King bed (for 2 people, or 2 people plus a child under 3). Ground floor rooms don't have balconies, but all others do. Request an upper floor if that's important to you. Each savanna has different animals so you might want to choose based on that. Ostriches can only be found on the Sunset Savannah, zebras are only located on the Arusha Savannah, and kudu are only found on the Uzima Savannah. Giraffes are the only animal that you can see on all three savannahs. Relatively speaking, very few rooms fall into the "standard" category so there's a good chance that people who book a Standard View room will be upgraded (especially if traveling during a less busy time). Of course, you should book a view if you really want it, but people looking to save a bit of money might want to take the chance. 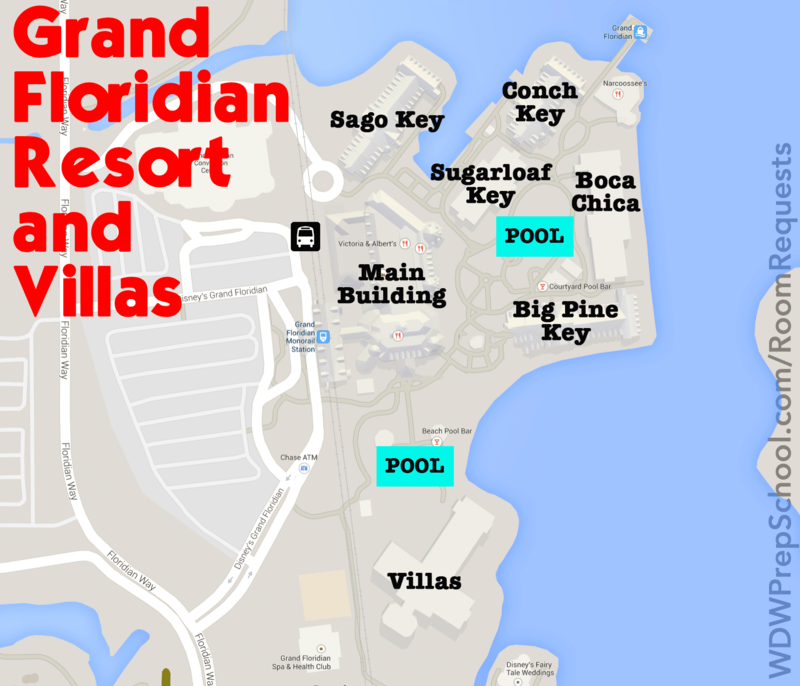 The information below is for the Beach Club Resort, not the Villas. I'll add the Villas info when I have a complete list of the online check-in options available there. Other requests you might consider making by phone: 1.) King bed (for 2 people, or 2 people plus a child under 3). There aren't a lot of rooms with king beds, but there are a few. 2.) Daybeds. Many of the rooms have a daybed in addition to the 2 queen beds. Groups of 5 are given priority for those rooms but anybody can request one for their room. 3.) Room location. The online check-in options for this resort don't allow you to pick what you want to be near so I'd add it by phone. You could request to be near things such as the lobby, Epcot, etc. About half of the rooms have full balconies and the rest have tiny Juliet balconies. I'd highly recommend requesting a full balcony in the online check-in. Stormalong Bay is a large, popular pool area and it can be loud. If quiet is important, consider requesting a Garden View. Although Illuminations can't really be viewed well outside of Epcot, you can catch glimpses from some Garden View rooms on higher floors. The information below is for Boardwalk Inn, not the Villas. I'll add the Villas info when I have a complete list of the online check-in options available there. FYI - almost all rooms have a daybed and balcony. The information below is for the Contemporary, not Bay Lake Tower. I'll add the Bay Lake Tower info when I have a complete list of the online check-in options available there. FYI - all rooms have a daybed. Odd-numbered Tower room beds on the Bay Lake side face toward Wilderness Lodge. Odd-numbered Magic Kingdom View beds face toward the Magic Kingdom. Some corner Garden View rooms are larger than the regular rooms. Since all Tower Rooms have a balcony, consider requesting a higher floor so you can have a better view from your balcony. 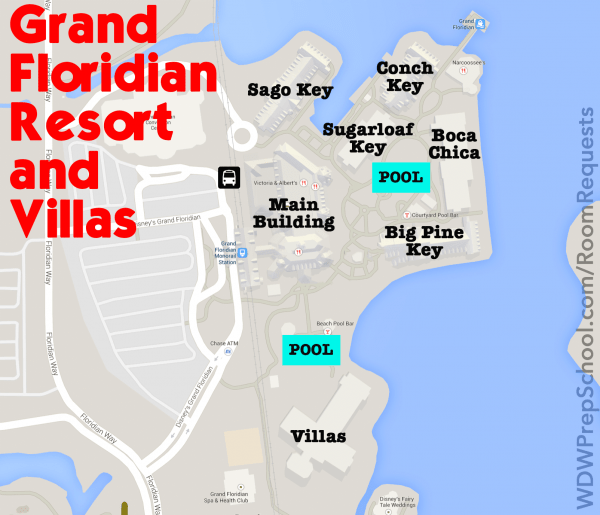 The information below is for the Grand Floridian, not the Villas. I'll add the Villas info when I have a complete list of the online check-in options available there. FYI: most rooms have a daybed and many have a private balcony. 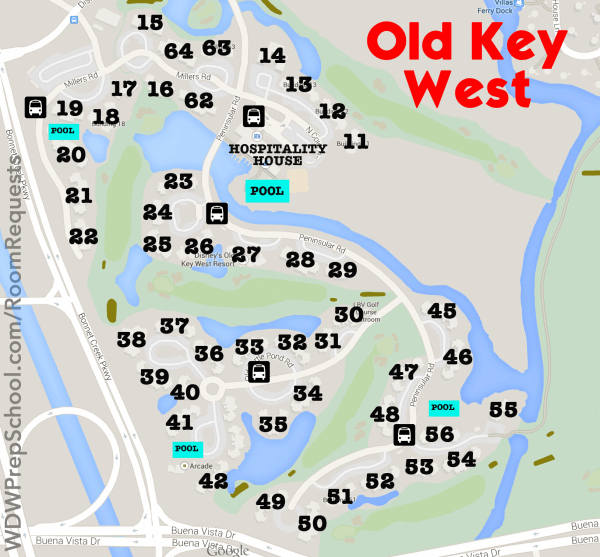 You have several room choices at Old Key West. These are available to people booking through Disney directly. People using DVC points will have different options. Only buildings 62, 63, and 64 have elevators. Buildings 29 and under have 1 bathroom entrance and it's through the master bedroom. Request dual bathroom entrances if you'd like two. The downside is that these buildings can be a bit further away from some amenities. The information below is for the Polynesian, not the Villas. I'll add the Villas info when I have a complete list of the online check-in options available there. Other requests you might consider making by phone: 1.) King bed (for 2 people, or 2 people plus a child under 3). King beds are only located in Samoa, Rarotonga and Fiji longhouses. 2.) Tonga longhouse (if you booked Club Level) - this building isn't one of the online check-in request options, but you can request it on your reservation. The Grandstand section is the first to get on buses in the morning and the first to get off buses when coming back from the theme parks, so it's probably the best section in terms of transportation. For things you need to do at Carriage House, it's not too far of a walk to get there. Congress Park has easy access to Downtown Disney/Disney Springs, and all of the buildings there are close to the bus stop. The Carousel Section has a lot of things that are not convenient about it, but if you have a car, you might like it since it's the closest to the main entrance and you can drive to other areas of the resort as needed. The information below is for Wilderness Lodge, not the Villas. I'll add the Villas info when I have a complete list of the online check-in options available there. Other requests you might consider making by phone: 1.) King bed (for 2 people, or 2 people plus a child under 3) 2.) Bunk beds in standard rooms. There isn't a "Standard - Bunk Bed" category but people who book Standard View rooms can request bunk beds. The 5th floor is the highest one with an open balcony (closed balconies have walls instead of railings so you have to stand on the balcony to see anything). Ground floor rooms have patios. Courtyard view rooms have a view of the Electrical Water Pageant. FYI - most rooms have a full balcony. Upper floors have a better chance of seeing fireworks. Have more tips or questions? Feel free to chime in with your thoughts in the comments. Do you have any suggestions for room requests at the Dolphin? Any chance you’re planning to add Bay Lake Tower to this article? 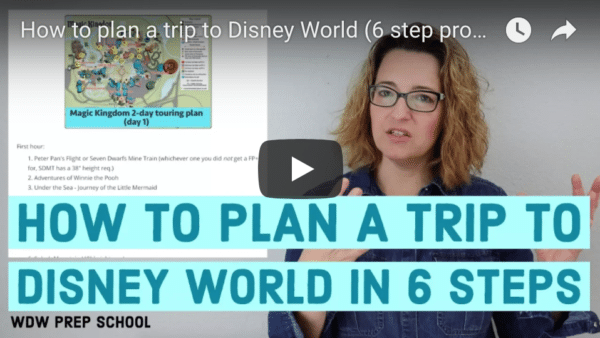 It would be super helpful as we plan our 2019 trip. I love this page & have used it a lot, but the tables don’t show up right anymore. I have tried 4 different browsers. Any chance of updating it? Or is there a browser that will work correctly? We had a split stay this month when we were at Disney. One part of our stay was at All Star Movies and the other part was at Saratoga Springs. I did a special request for both resorts. I asked for closest to transportation and lobby. I even explained why – I am disabled and can’t do a lot of walking, especially after walking in the parks.I paid extra for a preferred room at both resorts. Neither resort honored my request. While I had a preferred room, my room was about as far as you could get and still be in a preferred room. When I checked in (I do it online, but still do it in person) at Saratoga Springs, they changed my room assignment to give me a closer room. They didn’t at All Star Movies. I was at the far end of the building on the second floor. There are two new room categories at Port Orleans Riverside: “Standard View – 5th Sleeper” and “Garden View – 5th Sleeper”. Both are in the Alligator Bayou section and ensure that you get the fold-down bed for a 5th guest, They come with a slightly higher price. Hi, just wondering about out of country guests? Is there a better phone number for international guests to make room requests, or better yet an email address? Do you have Polynesian villa online check in information? Thank you so much! We’ll be at Coronado next month, and while I did request a room close to the bus stop and on the ground floor when I made the reservation (I’m disabled and can’t walk too far), I didn’t know I could request a specific building that’s near the pool AND the bus. And we’re going again next year & hope to be staying at the Wilderness Resort. I was showing my granddaughter the water parade and telling her how you can see that from the resort. But I thought we’d have to go stand outside somewhere to see it. Good to know that by booking a room with a courtyard view, we can see it from our room! Hopefully Disney has that as one of their military discount rooms so we can get it! This is strange because when I went to do online check-in at the Wilderness Lodge the only choice I was given was near elevator and of course that’s the last place I want to be. I wasn’t even given the option of a higher floor which is where I want to be. It looks like Disney has cut down on room requests but this also happened when doing online check-in for Grand Floridian. 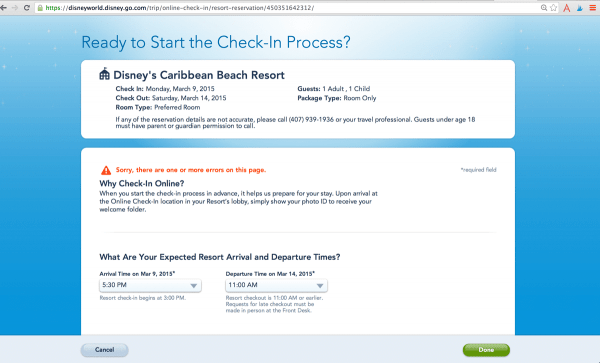 Hi… question about the Caribbean Beach online check in screen. On this page it looks like you can request certain villages for Caribbean, but when I go to the online check-in it only shows simple requests like lower floor/near trans/etc. Did they change the online requests or am i looking in the wrong spot? And yes I will be calling in a request later but just wanted some insurance doing both. Yes, they changed the request options. You can definitely call to put in your specific request if you want a certain village. So if I’m staying at Aoa In a little mermaid(and need a mricowave a room close to the front for mobile/ medical reasons) but also wanted to see if I can upgrade at least a night or 2 (i doubt I could get all 21 nights of my stay) in a cars themed suite what am I better off doing online,phone or in person check in? The Little Mermaid rooms are the farthest from the pool, lobby, and dining. Only way you can get a closer room would be to book a suite. I stayed there and had booked a Little Mermaid room. I’m also disabled. After walking the Magic Kingdom, I could barely walk when we left. I literally could not make it to my room. I had to go into the lobby and change our room to a Lion King Suite. The suites have microwaves, but cost a lot more. I would call. You may get there and find all the suites have been booked. How do I get a “travel with” number? I booked 3 rooms for our extended family at the Contemporary, and I am managing everyone with My Disney Expereince account. We would like to be adjoining or connecting. Just call Disney, let them know what you need to do, and they’ll be able to set it up for you. However, if you’re all booked on the same reservation instead of separate ones, you’re already connected just by virtue of being on the same reservation. Tips for Bay Lake Towers? my family of 4 will be taking our first trip to DW in September. I booked a garden view room at New Orleans Riverside. Can you tell me how to get a preferred room with a good view with minimal walking with my 3 & 5 year old? Which section and building would you recommend? Thanks! If you book a preferred room up front you’re guaranteed to be in 1 of 4 buildings. You will pay slightly more for a preferred room but then you are guaranteed to get it. You can always ask at check-in for an upgrade but there’s nothing definite to say you will get it. We pay the little extra (like $15-$20/night more) to get preferred location. For us it’s worth it but you really need to weigh out if the extra $100 or so is worth it for your family. You can call on your reservation and they can add it to your reservation. We are going again in November–LOVE Port Orleans Riverside!! Make sure to set aside time with your family to go see YeeHa Bob in the main house–it’s a blast and fun way to end a day–family friendly! Any info on Boardwalk Villas yet? Hi, Shannon! We are staying in an AOA Lion King Suite in October. Based on your suggestions, I plan to request for a lake or landscape view on a higher floor. Anything else I should request? You mentioned all resorts can request a crib. Do you know if this is a true full size crib or just a pack and play? LOVE your website. Thank you! 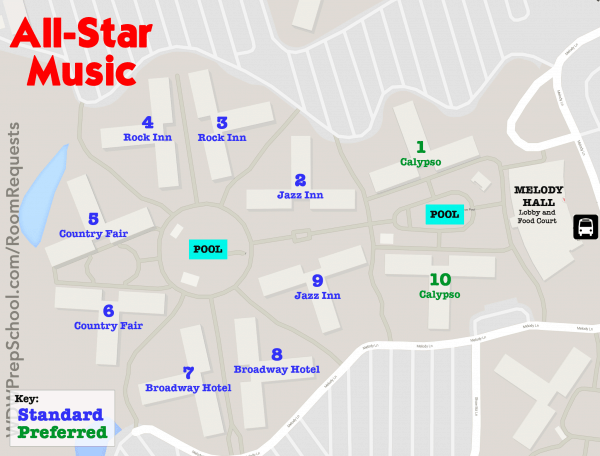 I have 2 standard rooms at All Star Music for August 2016. People mention asking for an upgrade. What would an upgrade be for All Star Music? Preferred Rooms would be an upgrade. We are going to stay at Animal Kingdom Lodge in April with a Club Level Svannah view. We are now not going to have my grandfather travel with us and have an adjoining room, so we would like to change to a 1 or 2 bedroom club level suite at Jumbo House for more room to spreadout since we wont have that adjoining room. Do you have any recommendations since Disney said there is no wait list and we or our travel agent just have to call back daily in the hope to upgrade? We are staying at the Swan in April with three children under 9. Any advice for rooms that have fireworks views? Also looking for room on higher floor away from elevator. We are staying at Pop Century and February and are traveling with another family. I have phoned in my room requests, one being connecting rooms. Should I still do online check-in if I have 4 specific requests for our room location? I know with online they only let you pick 2. I’m just worried the other 2 requests will get overlooked if I do online check-in. You mention that there’s an ability to request a microwave for your room. Is this possible at any resort/room? I was doubtful that would be an option as we’d have to book a suite in order to get a microwave. We have multiple food allergies and while I know WDW is very accommodating, it can still be quite a challenge – a microwave would be helpful. It’s never a problem to request a microwave in any of the resorts. We’ve done it many times at all levels – Pop Century, Caribbean Beach, Grand Floridian, etc. Have them note it on your reservation and if it’s not in your room at check in, just call the front desk when you get there. Have you updated information on Animal Kingdom Kidani? There seem to be a few questions, but I’m either not seeing the answers or they haven’t been answered? Also the section on this says it will be updated. We also are staying in June in a 1 BR Standard, but would love to increase our chances of a better view. We are renting DVC points. Thanks! Hi Shannon! I always refer to this article and have found it very helpful on my last 2 trips. We will be staying at the villas at wilderness lodge just before Christmas and I was wondering if you had anymore info on the villas since this was written? We’re staying in a deluxe studio. Any info would be helpful! Thanks! We are in Pop Century and want to see the fireworks. Would 60’s section lakeview work to get that? If we can skip the check in desk how do we know what our room number we have? They’ll text you the number. We are staying at the All Star Sports. Could you tell me what “Landscape View” means. Would that be facing pools and the football field and the like, or would that be facing the woods and parking lot? That view would be facing landscaping at the resort. How do you go about getting a “travel with” number to make sure that the accounts are connected with the people you are traveling with. Can you connect them together online or is this something you need to call for? You should call to get that number. I am an advid follower of yours on Pinterest, thanks for all the info! Do you have the layout and questions to ask about the Wilderness cabins? We are going Sept 2015. Thanks much! How would I request a certain building number, such as 45 or 51 at CBR? You can call to make those requests. Shannon, it’s looking like you might not be replying to comments…I hope you see this! we upgraded from art of imagination to Saratoga springs; do you think this is a bad idea? you noted that its the ‘least upgraded’ than all the lodging. are they smelly and old? and how hard is it to get into the treehouse villas? I’ve been told to ‘keep checking back’. thank you so much for sharing your wisdom!!!! I would love to see your Bay Lake Tower reccomendations. We are headed there shortly and would love to try for a great room. do you have suggestions for the Swan Resort regarding views and quiet rooms? would like to see a list similar to the Yacht Club. Hi ~ Do all studios at Saratoga Springs have a balcony? Do you include tips on WDW SwanDolphin? My husband and I used the Swan resort on our last 5 trips and have reservations for our upcoming trip next fall. We really enjoy it there and love the location. I am able to use the teacher rate, AAA or spg points which makes it desirable. Great post and I love your website! Also, your Pinterest board is amazing and really helpful; it allows me to put together all of your posts that I will need for my trip. I noticed that you mentioned to not do online check in if we are hoping to get an upgrade, but I have been having trouble finding any more information about asking for an upgrade, what should I do? We will be staying at the Beach Club in mid-May, thanks for your help. We are going to Disney World in September this year, I didn’t know the Toy Story room was a preferred room until reading this post, and we have already booked. Our Travel Agent didn’t know either, she just made a note to request it. My 4 yr old son would like that section best! (At All-Star Movies) I was just wondering since we are going during a slow time if they do any upgrades on rooms? just got back from staying in Art of Animation suites 3/2015. We stayed in Nemo suites because we were told they are closest to pool & transportation AND they usually go first. TRUE! We loved it. Our suites weren’t adjoining but we were next to each other. Decorated the doors with dollar store supplies (as I’ve read to do 🙂 made it so easy to quickly find our rooms. Who needs numbers?! Hi…..My husband and I want to take our son, his wife and 3 sons to Disneyworld in July. It will be my grandsons first trip. They are 11, 9 & 7. I want it to be the most special trip of a lifetime. I am overwhelmed by the choices. My husband wants to stay at a Disney Resort. We need two rooms or a big suite. I’d love to stay at the Animal Kingdom, but it’s expensive. Looking at the Dolphin, but the reviews are just okay. New Orleans Riverside maybe. Oy. Any suggestions to help me get started are appreciated. Thanks very much ahead of time! Also, I am a DVC holder. I’m really trying to narrow down room type at Port Orleans Riverside, I’d like a preferred but another view is in a building a little further (garden view) is the preferred room in the closer buildings worth it? I have a 12 yr old and a 7 yr old…Also does WDW need all the money when I book or when I arrive at check in? I’m planning on saving over half the money and arriving with this being paid via the Vacation Account…First time trip with my family and overwhelmed but excited! I suggest the preferred rooms in the Alligator Bayou section, specifically building 14 on the bottom floor. It is closest to Dining Hall and the buses. You will be walking 15 miles a day or more at the parks. With kids that age you will want to be closer to meals and transportation. Plus you can take a boat over to Downtown Disney. This section does not have an elevator, so you do not want to be on the second floor. Question about which option to book and which to request if you’d like two of the room “views”. I want to stay at Port Orleans Riverside in a King Bed room but also would like to be in one of the “preferred” buildings. Should I book the kind bed and request a building or should I book preferred and request a king bed? Thanks in advance! This and all of your posts have been incredibly helpful and fun to read in prep for our trip!! Good question and I think it’s so confusing how they do that. I’d book the one that was the most important and then request the other. Hi great post! We are checking in to the Bay Lake Tower on Saturday – any tips for that part of the Contemporary? Staying in a 1 bedroom villa. Great the post, I am saving all those info to study more so when I do my reservation I know exactly what will be best for may family. I would like to know which of the value hotels is closest to the parks by bus. And how long does it take (average) to get to each park, so we can program ourselves to make sure we wake up early enough to get to the parks before gates open. Great find! Thanks for sharing. Thanks for all of your info Shannon. That website has FW cabin maps and photos too. We booked a connecting room and the Disney employee assured us that we will be connected. The reason they said is that we have 5 kids and 2 adults (all my kids, and my husband and myself). I have been told this by them before and always received the connecting rooms. Have you ever heard this? Also, is it better to arrive earlier? I have heard that you are more likely to get a request that way. A friend is letting us use their dvc points to stay in a room at AKL that does not have a view. Of course we would love to get an upgrade when we get there to have a Savannah view. 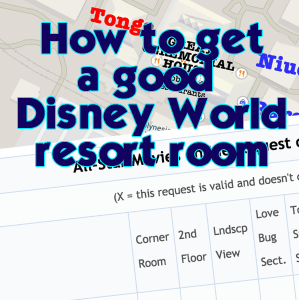 What should I request when staying in a dvc room? Jennifer, we are doing the same, renting points at AKL. I hope to upgrade to a savannah view also! Looking for tips. 1) Our party is split into two rooms but we have requested that they be connected both in MyDisneyExperience and over the phone. Do we need to state this again when we do online check in and if so, does this count as one of my two requests? 2) Do buses travel between Saratoga Springs and Downtown Disney? Since they are so close together I wasn’t sure if your options at that resort are only walking or the ferry. I’m currently leaning towards Congress Park which looks walk-able and I like that all of the buildings are really close to the bus. However, The Grandstand looks nice too (being the first stop in the morning is pretty tempting!) but Downtown Disney looks like a bit of a hick from Grandstand. Don’t know about your first question but we stayed at Saratoga Springs in 2010 and did bus from the resort to Downtown Disney. Love this post! Just one question: we are likely staying at CBR next fall, and you mention requesting certain buildings. I don’t think that is an option online, do you have to call to request this? If so, how far in advance should I call, the same 60 day mark as the online check in? Can you still make room requests if you book under a promotion, like free dining? Yeah, if you want a specific building, I’d call that in. You can do that at any time. It doesn’t matter if you booked Free Dining or not. That is a great post! Awesome information, thank you. Quick question, if staying at Caribbean Beach Resort with 5 plus an infant can we still get a Pirate Room? I read somewhere we could not. Also, where does that 5th person sleep, pullout twin couch? 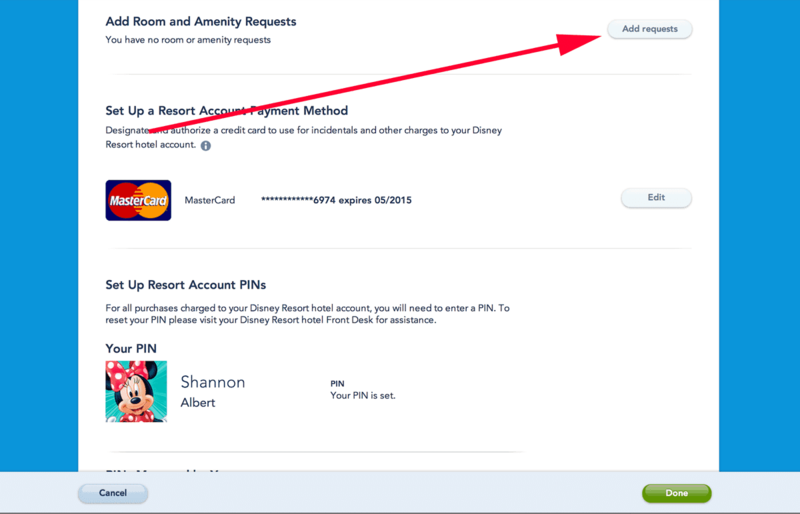 Can you do online check in if you are renting DVC points and (in my case) staying in the beach club villas? We bought points from a friend, and are staying at Animal Kingdom Kidani Village.. We just booked a standard, two bedroom room. Would love to get a room with a savanna view. Any tips? Suggestion? Also, we have 2 – 2 1/2 yr olds. Any suggestions on what location (building) to request? we are going in May 2015. This is a great post and I really appreciate all the information you put together here. One important thing to note about calling in special room requests: you can only use that number if you booked the reservation yourself. If you booked through a travel agent, the travel agent needs to call in the room request. I learned that the hard way after spending 32 minutes on hold. Hope this helps someone else! Also, I just did online check in for the Yacht Club. Corner room was not an option (not that I was looking for it, just wanted to let you know). Thanks for that reminder. I just updated the post with a note that people using travel agents will need to ask their TA to call it in for them. Thanks, Kelly. Are those the options for somebody who booked a cash reservation through Disney or using points on a DVC reservation? We used points and got those options – it was reserved under a standard one bedroom villa if that makes any difference. Hope that helps! Shannon, thanks for the info on this one! I was a big help. Quick question what section is Baloo and Moguli statues at? Can you let me know what section thanks! If you check-in online in advance and then need to cancel last minute due to an emergency, are you then at a disadvantage because you already checked in? I have always shied away from checking in online in advance for this reason. Looking forward to the Bay Lake Tower chart…that’s where we’re staying this summer with our toddler – we thought it would be the best choice because of the suites (we have a child with eating issues so we wanted the kitchenette) plus monorail for quicker escapes back to our room. Love this site. We are staying at Bay Lake Tower and I would love this info. When should I check back to get that information? Any tips for Dolphin hotel? Wondering if all Epcot views are about the same or if there is something special to request. I just did online check in for our trip in April spring break week is that too super early? And since I did it so early is it a better chance I will get my request filled? FYI My 2 request were highest floor and touchdown section. This is a great post. It is helpful to see that not all of the Preferred rooms are the same. We stayed at All Star Music in a preferred room and loved how close to the the main building we were. We then stayed at Pop Century in a preferred and were not close, in my opinion. Seems we were a bit spoiled at ASM. Now I know to ask for Preferred Pool View should we return to Pop Century again. Hello! Love the info – storing it up for our trip. We’ve almost decided to stay in a cabin at Ft. Wilderness. Any tips or suggestions on good locations, etc..? I was curious about you mentioning asking for an upgrade. We are booked at AOA in the Little Mermaid Standard Room and my online check in is in about a week. Should I wait and ask for an upgrade for a suit? Would this be an additional cost or is this common at AOA? I have seen many blog posts about people receiving an upgrade to a suit. There are only 4 of us so we don’t particularly need the suite but it would be a nice perk for my son not to be surrounded my Little Mermaid the whole trip. 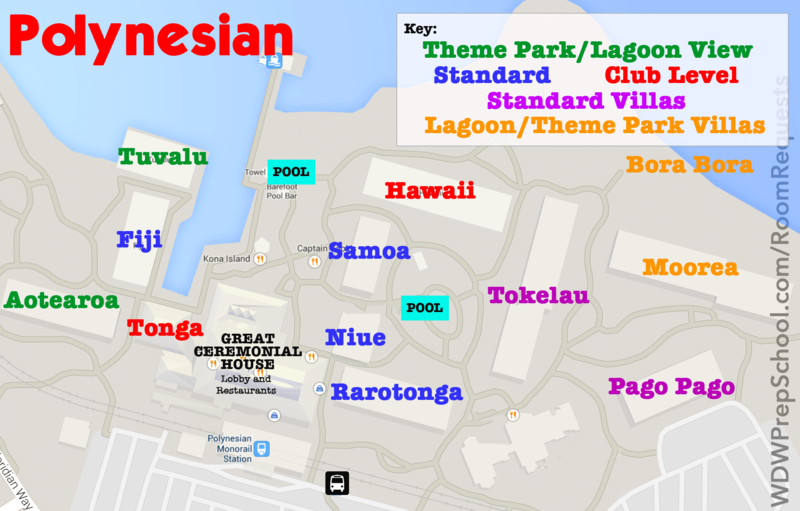 Hi, Regarding the Polynesian…I believe there are many garden view Or standard view rooms in Aotearoa. The whole side facing the monorail is garden view. On your listing though it says only lagoon or themepark view. Can you confirm if Aotearoa does indeed have garden view? I was planning on requesting this long house (have standard view booke) in October 2015 to avoid the east pool construction which will likely be ongoing at that time. Very nice post. Anyone wanting to say BC CL GV, be warned that ALL garden view rooms have a full balcony when CLUB LEVEL so don’t waste the request on that. HOWEVER I would use your request to ask for the NON HANDICAPPED room unless of course you need it. Very annoying that in the BC CL GV rooms is a handicapped room that is used for guests not needing it. Awful bathroom set up and super low bed and no water pressure. So just FYI. AND ALL OF THESE BC CL GV rooms connect and can prove noisy, so just some added information. Thank you for the great post! We are staying at the Contemporary Resort, Garden Wing, Garden View. I have heard that these rooms require a lot of walking to get to the main building. What request should I make to get us as close to the main building as possible and to minimize walking — ground floor, near elevator, near transportation? Yeah, I’d do “near transportation” for sure to minimize walking. I just checked-in online for the Wilderness Lodge and Corner Room wasn’t an option for a special request. Just FYI. How do you determine which resorts have queen beds vs. double beds? Our family of four is very TALL. We just cannot sleep comfortably in double beds; must be queen size. Thanks in advance. This is the first trip for our family and its a surprise for our daughters 8th birthday which will happen during our stay. We booked Pop Century with the Standard Pool View. What is the best section and area to request for this type of reservation? Also does it do any good to inform them that we have a celebration? Please can you tell me how to get a travel with number? We are visiting in May, our family of 4 and my parents and have 2 woods view rooms booked at Wilderness Lodge. I would just call Disney World reservations and tell them you’d like to be linked to the other group. Be sure to have the resort confirmation numbers for both and then they should be able to link them for you using a “travel with” number. You beat me to it – I have the same question, although my trip is alot further out. My family and my sisters family will each have a suite at AoA and would like to be next to eachother. I just linked two reservations today, with no problem at all! Very simple task to do when calling. First phone call that I had NO problems with, and didn’t need transferred! I did not ask for my travel with number but they assured me it was linked. Good luck!